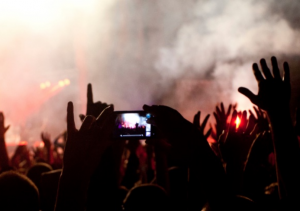 A survey released today by security company Symantec, maker of Norton software explores how people are increasingly dependent on their smartphones at concerts, events and music festivals. Yet, as the role of smartphones expands, so do the security risks. Nowadays, smartphones are more common than lighters (only 7% carry one) or even cameras (42%) at live events. Mobile devices have transformed how audiences watch a performance, with the emergence of “phone hogging” where audience members hold their phone above their head to capture photos or video from the show. 7 in 10 people admit to having used their smart phone to take pictures or record video during a performance, and could be criticized for blocking the view for others in the audience. 51% call or text to brag about the show, while 38% take to social media to post. Women are the worst offenders for bragging to others about their festival antics. Despite being an essential part of their festival gear, many are running the risk of losing their phone and data. While 89% of people attending a music festival this summer will take their smart phone with them, 36% of festival goers say they don’t use any form of security protection for their handset. 10% opt for crude forms of protection such as taping their details to the handset in case it’s lost. However, younger fans under the age of 30 are more likely to take precautions to protect their smartphone than those over the age of 50. While more young people said smartphones are important to the overall concert, event and festival experience, they’re also more likely to leave their smartphones at home if there’s an increased risk of theft, loss or damage. Festival goers can download for free Norton Mobile Security Lite, which protects mobile devices against loss, theft and malware.